The East Side News - Can Crossroads Collective live up to the legacy of Oriental Drugs? Read the full story from Milwaukee Record here. The word “iconic” gets tossed around a lot, but for Milwaukee’s East Side, few things are as iconic as the corner of North and Farwell. The beloved Oriental Drugs pharmacy/lunch counter/dime store held down that corner for more than 65 years, serving as a “crossroads” for the city at large. When it closed in 1995, folks were devastated. A handful of uninspired businesses cycled in and out of the space over the next few decades. Finally, in March 2017, the corner went dark. Looking at an old video posted by the Milwaukee Record, they heard ‘crossroads’ used multiple times to describe what Oriental Drugs was culturally and physically (given the 5-point intersection). The venture named itself right then and there. Crossroads Collective opened December 17. It’s been in business for less than a month, but it’s still worth asking: Is the new East Side business indeed a tribute to its gone-but-not-forgotten predecessor? In short, yes. It’s not perfect, but it certainly has the potential to live up to Oriental Drugs’ legacy. Let’s pay it a visit! First, some basics. 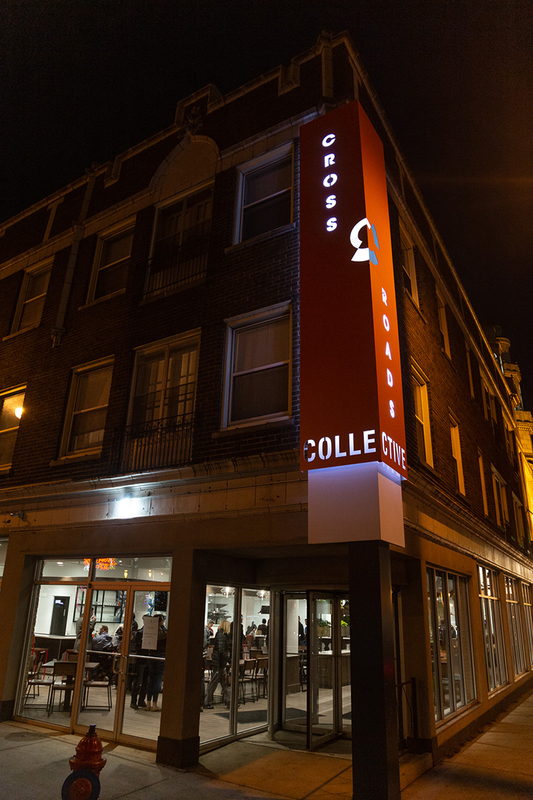 Crossroads Collective is currently home to six micro-restaurants: Heaven’s Table BBQ, The Laughing Taco, Falafel Guys, Frida (soup and sandwiches), Beerline Café (veggie and vegan crepes), and Scratch Scoop Shop (ice cream). Multiple visits over the past few weeks have confirmed that everything is really, really good. The Duck Duo Po’ Boy at Frida ($10) isn’t joking around. How do you “do” Crossroads? You walk up to the restaurant of your choice, order your food, pick it up, and eat at any of the tables scattered throughout the hall. Easy. Counter seating is also available alongside the full-service bar. It’s fast, casual, and convenient. It’s kind of like a food court, except not. About that. If you haven’t noticed, “food halls” are currently A Thing in Milwaukee. Crossroads is a self-proclaimed food hall. Sherman Phoenix is kinda-sorta a food hall. The reimagined Shops of Grand Avenue—a.k.a. “The Avenue”—will soon have a food hall where the singing electronic bears used to do their thing every holiday season. Is there much difference between a food hall and a food court? Strip away all the marketing lingo and you’re left with one important distinction: food halls have good (and local) food, food courts have Panda Express. Not that Panda Express is bad, but you get the point. And why not have six places to get good food instead of one? Divvying up the space into a collection of mini-restaurants was, and is, a brilliant idea. Food halls are currently A Thing; cavernous sports bars and so-so pizza joints are not. Credit Gokhman and company for holding out for this concept, and for not simply filling the space with another out-of-state chain, or a cell phone store or whatever. The East Side is better off for it. Then there’s Crossroads Collective…after dark. From 6 p.m.-1 a.m., the food hall is home to a secret “speakeasy” called Shanghai. The rigamarole involved in getting inside, or even finding Shanghai should appeal to all you Safe House fans out there: Walk into nearby Black Cat Alley, find a chainlink door, press a button on an intercom, squint as a bright light shines in your face, possibly give a password to a voice on the other end of the intercom, get buzzed in, walk down an alley until you find a door with an “S” logo next to it, and open the door. Inside, you’ll find a small, dim, and nifty little bar. It’s done up in old movie posters. One of the drinks (Nice Try, Lao Che) is named after a line in Indiana Jones And The Temple Of Doom. It’s perfect for dates, visiting friends and relatives, or for when you need to unwind after cutting loose at the nearby cat cafe. If there are any quibbles to be had with Crossroads, they’re mainly aesthetic. The outside signage is a bit baffling. An orange obelisk looms over the front entrance, its faces scribbled with bits and pieces of the business name in relatively small type. Squint and you’ll be able to make out “CROSS COLLE” on one side, and “ROADS CTIVE” on the other. As for the restaurants themselves, their names and logos are relegated to upper windows a few doors away from the main entrance. Plus, there needs to be coffee. Speaking of time and a lived-in feeling, this is where Crossroads has the most potential. Say what you will about the power of the built environment and the importance of architecture, but none of that means squat without one thing: people. Oriental Drugs didn’t win its way into Milwaukee’s heart because it was a particularly beautiful building, or because its formica was especially nice. It succeeded because of the people who frequented it. It succeeded because of the people, the connections, the memories, and the sense of neighborhood that hummed away inside its walls for decades. Crossroads isn’t even a month old, but, given time, it can succeed, too. It all depends on you.